An annual award to recognize community members for their outstanding contributions to UofL's sustainability initiatives. Joshua A. Smith was a one-time University of Louisville student who later pursued a career in the culinary arts. Happiest when creating something of value for others, he dedicated considerable time and effort to volunteering with the University's community composting project, helping turn food waste into rich, organic fertilizer to support another cycle of growth. 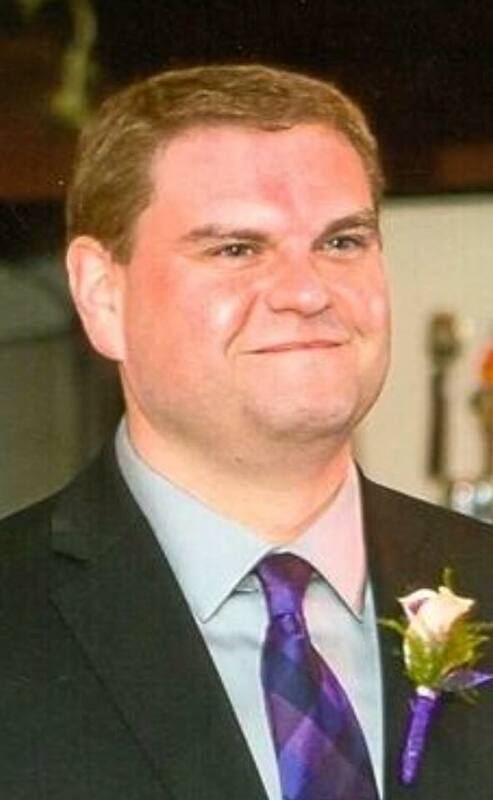 When Josh died unexpectedly on June 17, 2015, his enthusiasm for the composting project was so well known to his family that they requested mourners make donations to it in lieu of flowers. With those funds this award has been created to honor outstanding individuals who, like Josh, give their time and resources to work in concert with UofL's sustainability efforts to strengthen university-community relationships. A $250 cash prize and a personalized plaque will be presented to the selected recipient at the University’s Farm-to-Table Dinner each fall. Nominees must be community members operating alongside a University of Louisville entity (department, office, team, student organization, etc.) to directly facilitate projects related to sustainability. Submissions may come from within the University as well as from the general public; both self-nominations and nominations of candidates by other parties are encouraged and will receive equal weight. Current UofL staff, faculty, and students are ineligible, but nominations of alumni and former employees are welcome, along with staff, faculty, and students at other academic institutions. Why you believe they should receive this award. Please contact Dr. Barnes (brian.barnes@louisville.edu, 502-338-1338) with any questions about the award or the nomination process. 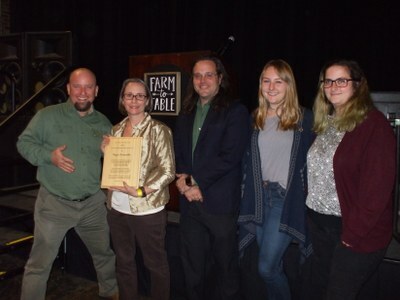 At the Farm-To-Table dinner on October 18, 2018, the UofL Sustainability Council awarded the 2018 Josh Smith Memorial Sustainability Award to our incredibly dedicated community partner, Tonya Summerlin. Tonya is a member of the Bellarmine University Class of 2018 who has gone on to graduate school in Ann Arbor, Michigan and was thus unable to be present at the ceremony. Her mentor at Bellarmine's School of Environmental Studies, Associate Professor of Geoscience, Dr. Kate Bulinski, accepted the award on her behalf and spoke eloquently about the positive and inspiring impact Tonya has had on our community. At Bellarmine, Tonya was an Environmental Science Major; Chair of the Rachel Carson Environmental Learning Community; Director of the Bellarmine Food Recovery Network; member of the Student Success Leadership Board; member of the Bellarmine Society; and active participant in the Student Government Association. As impressive as all that is, what is truly amazing about Tonya is that she was always extremely generous with her time, knowledge and talents. Tonya was an essential resource for the UofL Sustainability Council as we launched two exciting new student engagement initiatives over the past year. She tirelessly met and consulted with us as we established: 1. 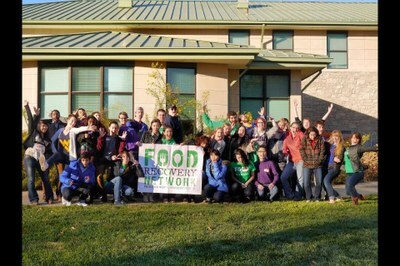 A UofL chapter of the Food Recovery Network to capture leftover food on campus and deliver it to those in need; and 2. A brand new Living-Learning Community in Sustainability. Her practical expertise in both of these areas and her sage advice has been instrumental in showing us the way forward and helping us trust that we can do it, too! We cannot thank Tonya enough for her support! 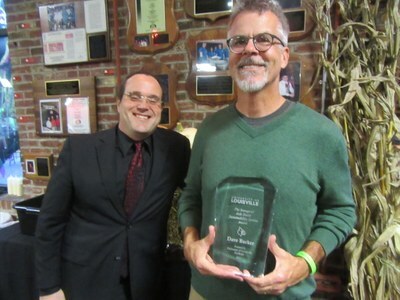 At the Farm-To-Table dinner on November 1st, 2017, the UofL Sustainability Council awarded the inaugural Josh Smith Memorial Sustainability Award to our friend and community partner, Dave Barker. Dave is a neighbor to UofL's Shelby campus and first approached us in 2014 to inquire about tapping some of our campus trees to make maple syrup at his home sugar shack. That initial, innocent inquiry has since blossomed into one of the most fun, visible, and dynamic Campus As A Living Lab for Sustainability projects at UofL. Throughout the years, Dave has selflessly given of his time, tools, equipment, and muscle to help spread the word and his enthusiasm for tapping untapped resources and turning them into delicious sustenance. In the springs of 2016 and 2017, Dave worked intimately with Dr. Linda Fuselier and her team in the Biology department to integrate tree tapping into new Sustainable Community Engagement sections of BIOL 104 - Laboratory for Introduction to Biological Systems for non-science-majors. The students experimented with tapping trees on Belknap campus to gather sap for syrup, learn about the process, and study the environmental conditions that influence it. UofL's maple trees on campus had never been tapped before, so students, faculty and staff were involved in learning about a new urban agroforestry resource on campus. EcoReps Lunch & Learn: Making Maple Syrup from UofL Trees (Pancake Party!) (Friday, April 21st, 2017 at Ekstrom Library). Photos. A hands-on Maple Tapping Workshop for the whole campus community and general public was held Feb. 13th, 2017 at the Garden Commons. Poster presentation by instructor Melissa Michael and Dr. Justin Mog at the Oct. 2016 conference of the Association for the Advancement of Sustainability in Higher Education (AASHE) in Baltimore: Sticky Sustainability: Tapping Untapped Resources on Campus #ULMapleMadness. Photos. Video. Maple tapping project a first for Belknap Campus trees (UofL News, April 25, 2016). 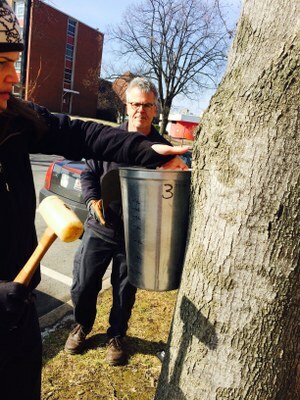 Melissa Michael describes class project to tap maple trees on campus for syrup (starts 23:08) (UofL Today with Mark Hebert, 93.9 FM The Ville, April 12, 2016). VIDEO (starts 20:08).